One of the best biographies of Charles Spurgeon is by G. Holden Pike and was written in 1894. I want to share one paragraph from this book but first I want to set up the reason I am using it. I have been troubled over the past couple of weeks as I have listened to sermons on radio, TV, and from local pulpits that completely are devoid of the gospel. They contain a lot of what has been dubbed as “Therapeutic moralistic deism.” Lots of exhortations to “be good”, “live better” and “do you best for God.” Of course, with some God-language pitched in. But no mention of the Gospel of Jesus Christ. No cross, no blood, no substitution, etc. It is all about making man “better” — whatever that means. We live in a day of gimmicks and entertainment that try to pass as the gospel, but it is as Paul said, “a different gospel, which is really no gospel at all.” The church in America wants to be “hip” considered “cool” and to do this they water down the truth of God’s word to draw a crowd. What a man of God Charles Spurgeon was!! He had no interest in innovation, or “updating” the Gospel. He simply wanted to preach it, proclaim it, and teach it at every opportunity. I remember one of the charges made against me several years ago, was “For two and a half years we have heard that we are sinners, and can only be saved by grace through faith in Jesus Christ.” I must confess with Spurgeon, those words did please me. Why, because that is the heart of the gospel; the heart of God’s word. That is all I have to preach to my dying day. This is our commitment at Grace Baptist Church. Even in the midst of “churches” that water it down and play games. Our only “draw” is the Gospel of Jesus Christ. That’s all we have; that’s all we need. Today marks the 500th Birthday of one of the most influential theologians in the life of the church of Jesus Christ. There has probably never been one so misrepresented and slandered than Calvin. But for those who take time to read his work there is an exaltation of Jesus Christ and a worship of God that is unsurpassed. So I gladly join the hosts in saying Happy Birthday!! In our study at Grace Baptist of The Truth Project one of the clearest warnings that we see in the Scripture is not to be led astray by “the lie.” Perhaps the greatest struggle for the church, and for Christians, is to not be shaped by the world rather than shaped by Christ. Satan is so clever in convincing us that we need to look like the world, think like the world, and live like the world. But God has called us to be peculiar people — children of light in a world of darkness. I am committed to the sanctity of human life . . . for the simple reason of the Imago Deo — all humans are created in the image of God. Thus it grieves me to see people who masquerade as Christians, even ministers of the gospel, who completely deny this truth and offer a “religious defense” to the taking of human life. Such is the case of the new president and dean of the Episcopal Divinity School in Cambridge, MA, “the Reverend Katherine Hancock Ragsdale”. Ragsdale has been serving as director of Political Research Associates, a left leaning lobby group. She also has served on the board of directors of The White House Project (a radical feminist organization), NARAL Pro-Choice America and the Religious Coalition for Reproductive Choice (both radical pro-abortion groups). She has been the vicar (read pastor) of St. David’s Episcopal Church since 1996. When a woman wants a child but can’t afford one because she hasn’t the education necessary for a sustainable job, or access to health care, or day care, or adequate food, it is the abysmal priorities of our nation, the lack of social supports, the absence of justice that are the tragedies; the abortion is a blessing. And when a woman becomes pregnant within a loving, supportive, respectful relationship; has every option open to her; decides she does not wish to bear a child; and has access to a safe, affordable abortion – there is not a tragedy in sight — only blessing. The ability to enjoy God’s good gift of sexuality without compromising one’s education, life’s work, or ability to put to use God’s gifts and call is simply blessing. The reason we are spending so much time on The Truth Project is to protect us from slipping in areas just like this. Some will say this will never happen. But I have the feeling a generation or two ago many in the Episcopal Church said the same thing. Paul’s warning to us is worthy of hearing: “Therefore let him who thinks he stands take heed that he does not fall.” (1 Cor 10:12). In other words, never say never. Unless we stay vigilant for the truth we are walking on dangerous ground. Have you noticed in the news how it seems that more and more people are getting forceful in their attack on Christianity? I don’t just mean not hanging signs that say “Merry Christmas” and substituting “Happy Holidays.” I mean out and out pointed attacks on not just the holiday but on Christianity itself. Indeed, a frontal attack on God. For instance, in our nation’s capital this Christmas season the American Humanist Association has initiated a campaign to put signs on city buses and the Metro system that say, “Why Believe in God? Just be good for goodness’ sake”. In 2007 the Pew Research Center found out, in a survey, that the majority of Americans believe that it is not possible to be good apart from a belief in God.. This may very well be so, but I believe that the pulpits in our churches have contributed to this sad state of affairs. Too many times each week sermons concentrate on “being good” or “trying your best” and the glorious Gospel of Jesus Christ is never proclaimed. The Christianity of the 21st Century has become both Christ-less and Gospel-less in many instances. There are many sermons preached over the airways and in the pulpits of our nation that would support the atheists in their claim that we need to “just be good for goodness’ sake.” But that is not the Gospel. We must pray this Christmas season that we will return to a Christ-filled, and Gospel-filled Christmas, and way of life as the church in America. Another example is taking place on the other side of the country in the state of Washington. Each year a nativity scene is set up in the state capitol. This year the Governor of Washington allowed an atheists group to put up a sign right next to the nativity scene — it simply proclaims that “there are no gods” among other things. Now, don’t get me wrong, I believe that the atheists have a right under our constitution, to free speech. They can and should be able to speak freely their foolishness without any fear. However it seems to me to be simply in “bad taste” to allow a vicious attack placed alongside the nativity of our Lord. In fact under some situations, with a few words changed this would be classified as “hate speech” and punishable by law. My friend, Walter Price, in California, sent me a quote today from G.K. Chesterton written in 1922. Chesterton said, “If there were no God, there would be no atheists.” Think about that! He’s right, you know. We should not fear the atheists’ attack on the faith. We must not change one thing in light of their signs and statements. We simply must, in this Christmas season, be certain that we are proclaiming the Gospel of Jesus Christ with boldness and clarity. I love this season . . . Not because of the gifts and parties and decorations. I love it because it gives us a major opening to talk about Jesus . . . who came as a baby, but didn’t stay in the manger. He grew up and spoke with authority as no one had ever heard . . . He did miracles like no one had ever seen . . . But this was not the important part in a real sense. He voluntarily went to the cross at Calvary to atone for sin . . . To become the Savior of the world. This is why I love this season!!! Have you ever gotten into a theological discussion that just seems to invite disagreement? There are a lot of different subjects that can lead to that, and most of the time the problem is that one side or the other “assumes” what the other believes without letting him define it himself. One such subject is “Free Will.” When people ask me if I believe in “the free will of man,” I usually answer, “Of course I do and I don’t.” Michael Patton, over at the Parchment & Pen blog of Reclaiming the Mind Ministries has written an excellent article entitled What Do You Mean By “Free Will”. I highly recommend this to you, especially if you struggle with this issue or you find your views being misunderstood. Reclaiming the Mind Ministries has some of the best theological studies for online that I have ever seen. I encourage you to spend some time checking them out. I was honored to be asked to write a “Pastor’s Perspective” article in the July, 2008, issue of TableTalk the devotional magazine of Ligonier Ministries. The entire issue deals with 8th Century and Christian controversies of that era. You can read my article by clicking HERE or you can read the entire issue on the 8th Century by clicking HERE. If you want to read the most recent issue click HERE. 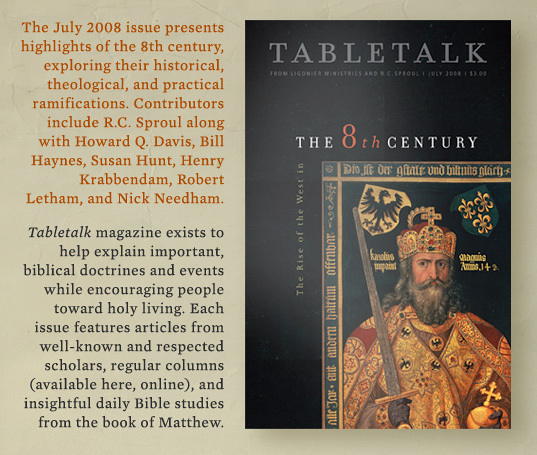 TableTalk is one of the finest resources for daily study and spiritual growth that I know of. It draws on the work of R.C. Sproul who was one of my professors in DMin study. Dr. Sproul is one of this generations premier theologians. I highly recommend subscribing to TableTalk. You can do so by clicking HERE.